﻿A short starter list for those who long to put a name with a beak. ﻿﻿﻿Every Texan is familiar with icons like the Alamo and the state Capitol, but how many of our feathered friends can you identify? Northern cardinal, blue jay, grackle … Those are pretty easy, but there are so many more! Birding is one of the fastest-growing outdoor activities in the U.S. With 639 species of birds documented in Texas, things really are bigger and better here in the Lone Star State. Birding in Texas is year-round, thanks to our location and diverse eco-regions, and can be rewarding in every corner of the state. 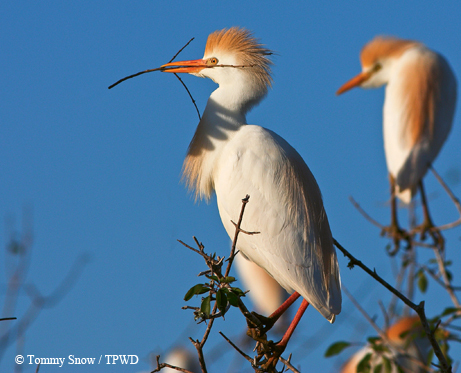 TPWD's wildlife trails make it easier than ever to find the best birding hot spots. Learning to identify all our state’s birds can be a daunting task, so here’s a list that’s been trimmed down to some of the more ubiquitous and easily seen species. So, armed with this starter list and a helpful birding guidebook and a pair of binoculars, head out to your yard and see how many you can spot and identify. Once you’ve conquered your own little patch of green, try it at a state park. Bring family and friends and turn it into a contest. You’ll find being bird-brained is fun for everyone. Such a list, of course, has to begin with the state bird of Texas. This gray and white bird makes up for its drab appearance with a voice that could compete in any singing competition. The Latin name (Mimus polyglottos), which translates loosely to “the many-tongued mimic,” really sums up this songster. Instead of singing its own song, this bird performs like a tribute band playing an original band’s song note for note. A seasoned male mockingbird can sing the songs of dozens of other species found nearby and make a variety of other vocalizations, from frog sounds to car alarms. ﻿Known colloquially as the “chicken hawk,” this large raptor can be seen in just about any open habitat, with numbers reaching their peak in Texas during the cold winter months. 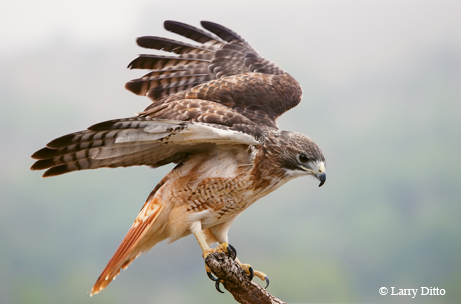 Often seen sitting on a commanding perch along our highways, the hawks look as if they’re watching traffic pass by when, in fact, the grassy medians support lots of tasty rodents. This fondness for rodents makes them good neighbors for us. Instead of red, look on the top of the tail for more of a terracotta-orange color. While it’s perched, two of its best features are often visible on many but not all individuals: a dark belly-band across its white underparts and the messy white blotches on an otherwise chocolate-colored back. More old-timers refer to this species as a “blue crane,” but this heron is not related to cranes. This tall wetland inhabitant will hunt for fish, frogs, crayfish and the like in just about any creek, pond, lake or roadside ditch. With an overall grayish color, this bird does have hints of blue-gray here and there. 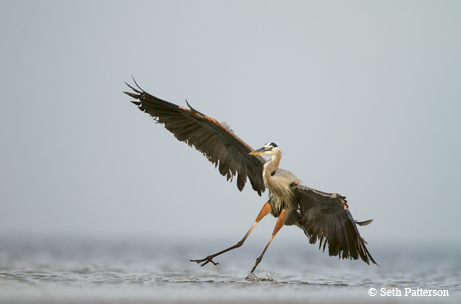 In flight, the great blue heron might conjure up beliefs that pterodactyls still fly our friendly skies. When waters freeze in winter, don’t expect these birds to chip away at the ice. Instead, watch them switch to dry upland settings in search of rodents. Who knows, maybe a switch from slimy fish to furry rats every now and then breaks the monotony! Some call it the “mud swallow” because it builds open, cup-shaped nests from mud on bridges, culverts, porches and patios. If a nest shows up on your front porch, you might have to deal with occasional dive-bombs from a protective parent and a small pile of poop you’ll have to wash off. These aerial insectivores are good neighbors, though, since they eat a lot of our yard’s pesky insects; in some cultures, it’s a sign of good luck if the nesting birds select your home. Watch for their deeply forked tail and, when the sunlight hits them just right, a beautiful iridescence of dark blue-purple on the head, back and tail. 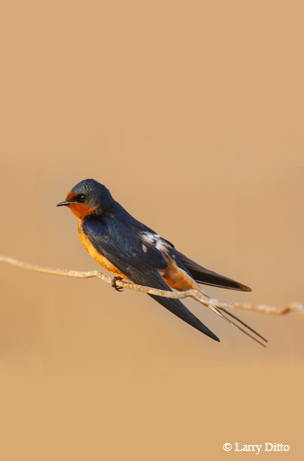 There are two other mud-nesting swallows in Texas, the cliff and cave swallows, but neither has a forked tail. Also, the cliff swallow sets itself apart in terms of architectural design with a gourd-shaped mud nest. Early American settlers from Europe confused this carrion eater with the “buzzard” back home, but the two aren’t alike. Though the name “buzzard” is used in other parts of the world for hawks, it refuses to be erased from our vocabulary for vultures. When soaring, this vulture has a silvery tinge to the trailing edge of the entire wing. When they’re feasting on roadkill, notice their milk chocolate coloration and, in adults, a red featherless head. Only a mother could love a face like that. 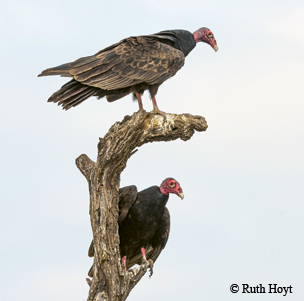 There is another species of vulture in Texas: the black vulture. The black vulture sports a gray featherless head and is dark black. During flight, black vultures also have the silvery tinge to their wings but only on the outer tips. If we didn’t have vultures, our roadways would soon be overrun with smelly, unsightly roadkill. 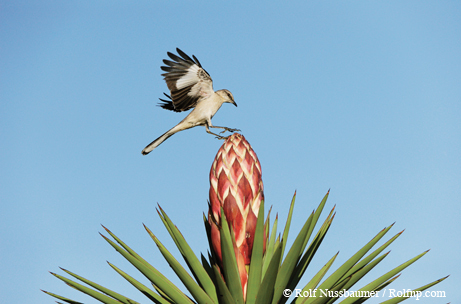 How great would it be if every bird were named for its vocalization, like this one? A resounding “kill-dee, kill-dee, kill-dee” can be heard not only in natural settings, but also in ball fields and parking lots. In flight, watch for the fiery orange rump and pointy wings and, when perched, watch for two distinctive black bands across the breast resembling wide necklaces. If you approach one and find it limping away with a drooped wing and loud cries, know that you’re being duped. This action — called feigning — is designed to lure you away from a nearby ground nest or nestlings, so tread lightly. This species is not native to the Western Hemisphere. Introduced more than a century ago, it has spread from Alaska to Argentina and all points in between, including Texas. Our state’s first sighting was in Galveston in 1867. If there are a few houses or grain silos around, there will be house sparrows. They’re actually weaver finches; folks who have found their bulky nests constructed of wispy grasses can attest to this. Purple martin landlords who aren’t monitoring their nest boxes can get overrun with these pesky sparrows. The male has a black goatee; the female is very dull and plain, but her pale eyebrow is readily seen. 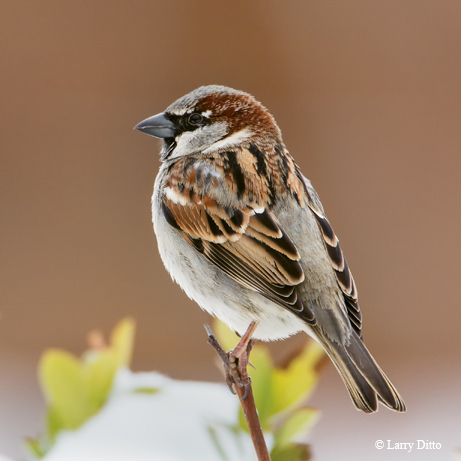 In urban settings, this is the expected sparrow in parking lots, often gathering into huge, noisy roosts each evening. This bird evolved with the ever-moving herds of bison, and the constant moving never allowed it to settle down and raise a family. So it developed a habit of dumping its eggs into the nests of unsuspecting foster parents. Now they follow livestock, bringing them closer to a wider array of foster parents. 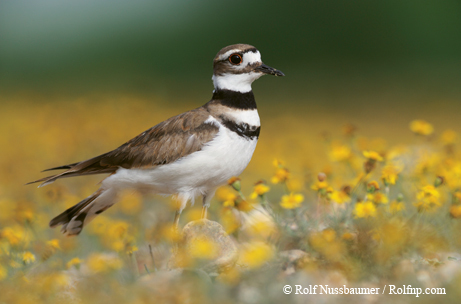 This creates conservation concerns for other bird species. 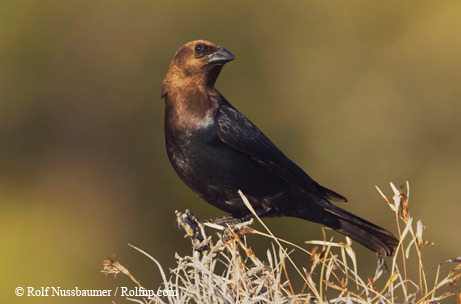 The cowbird’s name makes sense once you’ve spotted a male with a shiny-black body and flat-brown head. The female, however, doesn’t have the same paint job. She has no streaks, no spots, no speckles, no bling — just one shade of earth-tone, grayish-brown. Watch for them to attack your seed feeder or cruise through a mowed lawn. 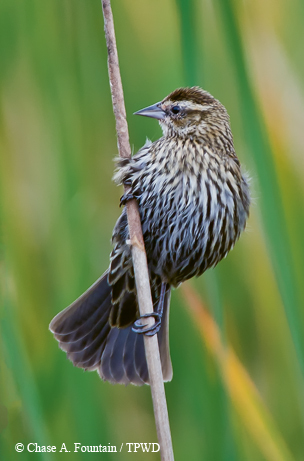 In springtime, no other bird is more noticeable or recognizable than the male red-winged blackbird. He sports striking epaulets of crimson red against a glossy black body. The female, though, has a completely different appearance. Heavily streaked and looking like a jumbo-sized sparrow (which is the section of the bird book where many new birders look to identify her), she is likely the most misidentified bird in our state. Look for her noticeable pale eyebrow and that blackbird-like bill. She’s often in flocks with other females of her kind, and, in the breeding season, she becomes one of her mate’s many girlfriends; he maintains a harem, which he fiercely guards and protects. This non-native dove first arrived in Texas via Texarkana in 1995 and quickly spread throughout the state. In urban settings, watch for a large pale dove with a black ring around the collar. More importantly, open your ears to the incessant cooing sounds of these doves, as they are prolific singers. A unique vocalization they make as they’re taking flight or about to land is reminiscent of a loud kitty’s meow. If you spot them at the seed feeder, you’ll see that these doves are larger than their native cousins, the white-winged and mourning doves. 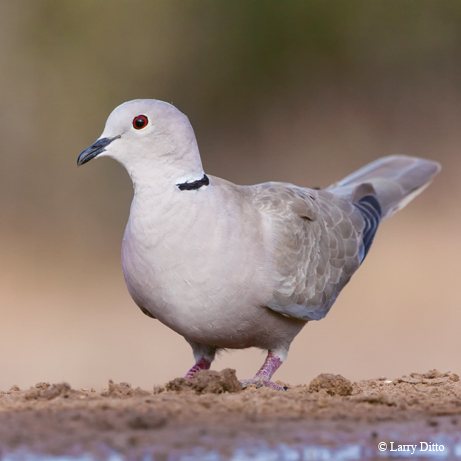 The collared dove has taken the place of the paler, ringed turtle-dove, another non-native dove, and appears to be calling Texas home for a long time to come. 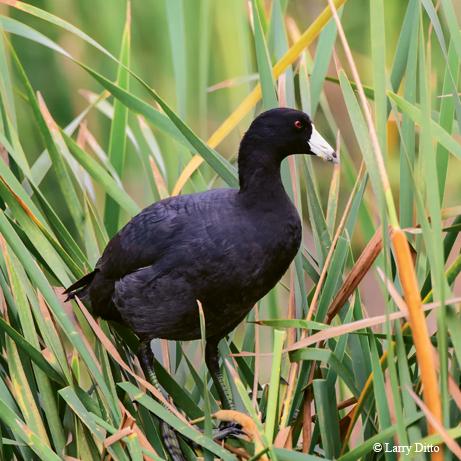 I don’t think it’s a compliment to be called an “old coot,” but it’s OK to spot some on a nearby lake or reservoir. Since this bird needs a running start in order to take off from the water, it doesn’t hang out in small bodies of water. If you find one there, it’s usually an indication that inclement weather grounded the bird and the runway is too short for it to take off again. Commonly occurring in rafts, or large floating flocks of birds, this all-dark bird has a pale white bill and feeds on aquatic organisms and vegetation. This species, no relation to ducks, pours into Texas during fall to spend the winter months where water doesn’t freeze, but watch for most to head north in spring. Some stick around throughout the year and raise a family. The young look similar in shape but have a whitish head that distinguishes them from mom and dad. Sometimes referred to as “cow birds” for their fondness of following cattle, these birds are fairly new to Texas, making their debut here in 1955 on Mustang Island. They follow cattle because, while walking or grazing, big bovines flush insects hiding in the grass. Those insects are precisely what the egret desires. The egret is not plucking ticks off the hides of livestock, a common misbelief. During the breeding season, watch for straw-colored patches of feathers on the head, breast and back of these otherwise white birds. These birds seek refuge in numbers. Their communal nesting colonies, called rookeries (or, more correctly, heronries), can be very large, with nests numbering in the thousands and often mixed with other species of egrets, herons, ibises, cormorants and more. There’s great safety in numbers — humans live in similar settings we just call neighborhoods.